Early spring is an amazing time for many gardeners, as well as those that want to be one. During this time plants are beginning to wake from their long winter's sleep. Although a lot of people sit back and wait for their plants to do whatever it is that they do in early spring, others, like you, are eager to help them be all they can be this year. Many homeowners just let their plants come and go as they please. Due to this minimal care for plants, many varieties will start to die off from neglect. Obviously, you’re looking to do a bit more to help your plants get off to a good start. If you are consistently maintaining your landscape it will be healthier, live longer and produce more ornamental flowers than those of the neighbors who don't tend to their plants as often. There are a variety of herbaceous that can survive the winter in many climates if they’re tucked in under a layer of organic mulch that’s two to four inches deep. While mulch protects them from drying out or freezing when it’s cold, once these types of plants start to grow in the spring, that life-saving mulch can become a real enemy. It’s vital that you pull back the mulch from your plants every few days to check for green growth above ground. Once you see it, hollow a moat out between the plant and the mulch. Make sure no mulch is touching the new growth and that the moat you’ve scooped is about two inches wide to allow for further safe development. Several opportunistic fungi will take advantage of young, green growth that’s constantly touching something moist, like that mulch. There’s a fine line here, tread carefully. If you have a garden plot and failed to fertilize it in the fall, now is the time to get to it. As soon as you can work the soil, this is a great opportunity to take several samples and use a home test kit to determine the condition of the soil. This will give you some kind of idea about the condition that your soil is in, as well as an idea of what you can do to fix any problems. For example, you may find that your soil is low in nitrogen, a vital nutrient for plants that grow a lot of leaves very quickly, like your lawn. In this case, you’ll follow the instructions for feeding the type of plant you intend to place in the tested area, using a precise amount of fertilizer, so as not to encourage long, spindly growth in those eager plants. 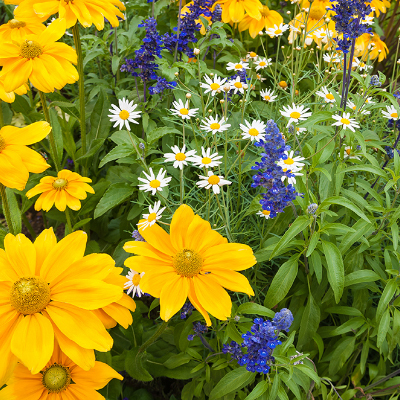 Most established perennials are fine with fertilizer that’s mixed into the top two to five inches of soil, but always check before you get too wild with it. A few species may have unusual reactions, including but not limited to developing an overall burned or wilted look due to root destruction. Never apply more fertilizer than necessary due to the risk of runoff and pollution of waterways. Once the nighttime temperatures are consistently above freezing, you’re ready to turn the water back on. Your plants will appreciate the long, deep drink and you’ll be happy to not have to water each one by hand. Remember, when turning irrigation systems back on after being drained, do so slowly. Opening the value too quickly can result in a high-pressure water surge that can rupture sprinkler heads or burst fittings. Be prepared to turn the system back off if a surprise freeze creeps on, but waiting as long as possible to get the irrigation started again is also a fairly safe bet.